When chosing a venue for a business reception, cocktail party, or launch event you not only need somewhere atttractive, but somewhere that's in the right location, that is easy to get to and, especially in the evening, easy to go home from, somewhere that has a track record of successful hosting, and you want to be confident that the food and service will not let your organisation down. You might also hope that the price would be realistic. Read below to see how we offer all these things. A first-rate venue at value-for-money prices. 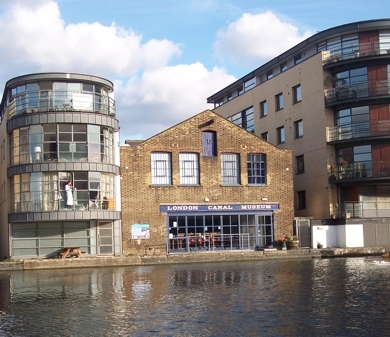 Combine a beautiful, historic venue in a tranquil waterside location, a lovely view from the windows or outside, and the convenience of a very short walk from one of London's busiest transport hubs. That combination is London Canal Museum. 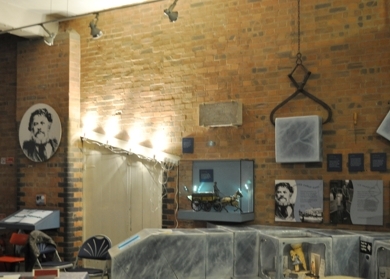 The museum, in a charming historic waterside building, is an unusual place, full of character and interest. It was built as an ice storage warehouse and you can look down into the uniquely preserved ice well below the floor. There is access to the canalside with its fine views. There are two floors. 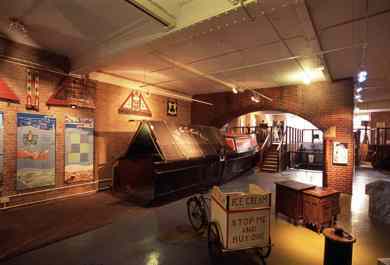 The ground floor is dominated by a large arched scenic bridge and a colourful narrowboat, with lots of other exhibitions all around you. It has access to the wharf outside, which guests can use, weather permitting, until 2200 or the end of the event. The rear looks out over Battlebridge Basin, a peaceful urban beauty spot surrounded by a mixture of historic and modern buildings, and filled with colourful canal boats. Although close to King's Cross and St. Pancras stations and the hustle and bustle of a major transport hub, the museum is in a world apart - the world of London's canals. Networking is all about bringing people together to make business contacts. Holding a reception or cocktail party in a museum makes networking easier - there is always something to talk about with complete strangers that gets a conversation started. Hosts beware, your guests may not want to leave! The atmosphere of the museum is condusive to networking and conversation. Location is vital if you want to encourage a good attendance. The convenience of the journey home afterwards is the first thing many guests consider when deciing whether to accept your invitation - though they might not admit it! We are just 10 minutes' walk from the Eurostar trains at St. Pancras International. We are within a short walking distance of three mainline termini, and there are no fewer than six Underground lines serving King's Cross, and almost too many bus routes to count. Walk to these stations for through trains to a large part of England. Take time to read all the details. Most of the other London termini are a single Underground journey away. 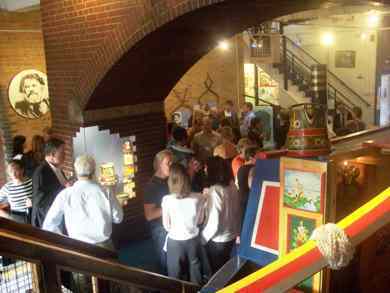 Guests attending an early evening reception at London Canal Museum can return home the same evening to Paris, Bruxelles, Leeds, and Manchester. Of course, minicabs can be called to the door of the museum to take guests to destinations by road. And arriving after work is equally easy; we are a few minutes' journey from the City of London and easily reached from all parts of the Metropolis. The convenience of our location does not come at the price of unattractive surroundings. We are situated in a pleasant mixed street of residential and office development, of both modern and renovated older buildings. The busy Caledionian Road is just around the corner, but the museum's location is quiet. We're not only easy to get to by unsurpassed transport links. We're accessible to all your delegates when they get inside. Both floors are accessible to wheelchair users, the stairs are well appointed for the visually impaired and mobility impaired guest, there is a ramp to the wharf, and signage is designed for the visually impaired and incorporates Braille. The street entrance is level. So be proud to invite your guests knowing that everyone can attend. We have hosted a very wide variety of events since 1998 and our experience is available to help you plan an event that goes smoothly from start to finish. Hosting events attended by "VIP" guests does not pose us any problem - we have welcomed two Prime Ministers (although one was in exile from his own country!) and a number of cabinet ministers to the museum in the past. We are accredited as a "Green" venue and we will work with you to ensure that the evironmental impact of your event is minimised. We do not provide food or drink (except tea/coffee) ourselves. Clients are free to choose any caterer to provide food and service, and to buy drinks wherever they wish. We maintain a list on this website of caterers who are familiar with the museum, and these firms, in most cases, also have a track record and have worked with us before. We don't reccommend any firm but these suggested firms may be a good start to your search for the right caterer. If you already have a favourite firm, or you want a specialist caterer, you can use them. Unlike venues that insist on a shortlist of caterers, you have a choice, and this means you can obtain the best food, service, and value, from a caterer who is in competition for your business. If it suits the style of your occasion, we can add atmosphere by providing temporary coloured lighting or other decorative lighting such as up-lighters. This is of course most effective during the hours of darkness. Some receptions are combined with a more formal business meeting or a presentation. We have two floors so we are ideal for this, using the first floor for a presentation, for example, and the ground floor for a drinks and canape reception. There is more detail on other pages about our services for business meetings. We have a range of audio-visual equipment available in-house so you can combine a presentation with a reception very easily. 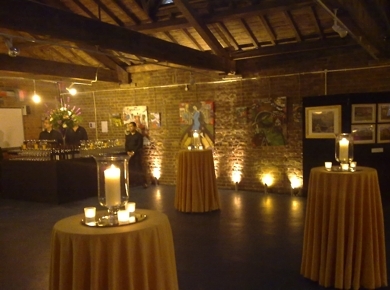 You can also add an exhibition to your event . If you would like to add entertainment to your reception, you can engage a string quartet, a harpist, a magician, an entertaining speaker. If you would like a costumned character possibly related to the ice trade or the canals, why not discuss your aspirations with us? We have the contacts and will help you make plans. Loud music (e.g. a DJ) is only allowed at weekend parties. Suidable for 40-200 guests, unseated. Choose your own caterer. We don't take commission from caterers, so you don't have to pay more. Available from 1630 Tuesdays to Sundays or any time on Mondays. Our own mooring for boat trips and to arrive by boat. Street parking is free in the evenings. Some tables and chairs are provided free. No charge for coat rails, or use of kitchen. No corkage charges. No charge for reasonable refuse disposal. Conference room can be booked for storage and preparations before or after the event. Music that can be heard outside is only allowed at weekends. Wine glasses are available for hire from us if required.